If all you saw at this year’s Smackfest was beach volleyball, wild costumes and bizarre extra-point “challenges,” then you missed something big. 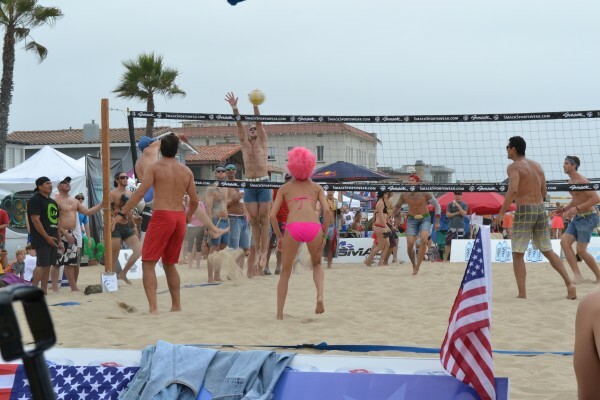 While it is undeniable that the crowd is drawn in by this trademark hilarity – one player noted to the resounding approval from teammates that “everything’s better in a costume” – Smackfest also includes a more serious side, with elusive “Pro-division” challenge-free play and a focus on what many fans called its main achievement: “high quality volleyball.” Balancing between these seemingly opposing forces, this four-man competition gives the beach the kind of gift you can’t exactly put your finger on until after you’ve left: the colorful continuation of local lore. “It gives opportunities for players that are not in the upper echelon to play against the amazing players they hear about: with or against local pros,” he said. The truth is, when these different worlds of beach volleyball come together, a modern sort of oral history is written with each volley. More than anything, the fun in Smackfest is about asking and answering these questions. Learning what challenges were dreamt up and who took down titans, playing a part in the history that unfolds in the process. Hermosa’s community is built on these stories; they fashion the classic “beach culture” that makes it unique. It is no surprise, then, that beach volleyball first and beach culture second are what bring this Hermosa tourney international renown. “We’re known for volleyball”, the announcer said. “(Smackfest) shows how great it is for the community”.